If you are blogger at wordpress.com, this post here will help you to solve a big problem. 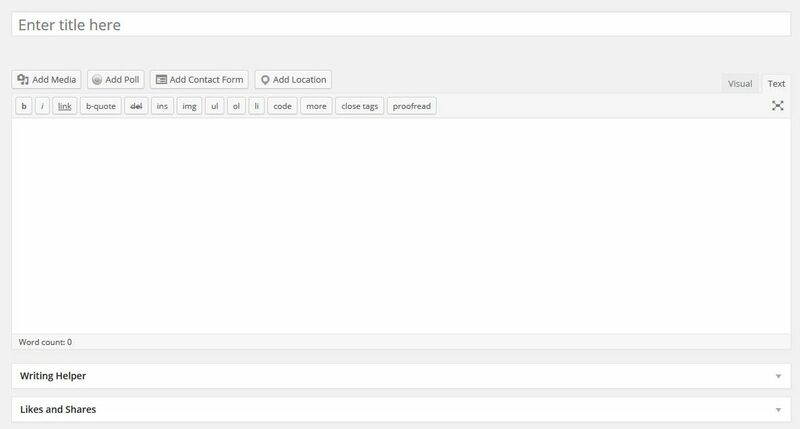 As you have noticed, the decision makers at WordPress want to force you to use the recent new editor interfaces that is purely designed for mobile devices and for users who only create short-form content. This is of course a pain if you are desktop user and if you like to create long-form content as well. In this post you will learn how to get back to the classic editor permanently. All shall be well, I hope. danke trotzdem. 🙂 Da ich nach wie vor den entsprechenden Thread im Forum abonniert habe, bekomme ich ja postwendend die neuesten Nachrichten von da. Und so bin ich dann auch auf Dennis und sein “Diary” – das ich im übrigen abonniert habe – gestoßen. I hadn’t realised you had all this going on, Pit. 😦 I don’t much like the new editor but I do find you get used to it. Most of my posts take a while to put together, and for the walks especially I make lots of visits to the post before I get to publish stage. Once you have made the initial ‘save’ it’s easy enough to go back to the old format via the dashboard. I don’t know how long this will continue so I’ll go and read the article in full. Sadly, I don’t think you can stop ‘progress’ and it’s a fact of life that the youngsters (and not only them) live on their smartphones and iPads. Thanks for taking your time and writing a comment. 🙂 I’m afraid I’ll have to agree with you that we can’t stop “progress” – whatever the WP developers think that is. As to smartphone and iPad users: I don’t think the majoriyu of the people blogging via WP are those. So WP should still cater to “old-fashioned” users. Well, we’ll see. In the meantime I hope I will still be able to use the classical eidtor for quite some time. Ist schon klar, dass heute auch sehr viel für Tablets und Smartphones angepasst wird. Aber das sind ja meiner Meinung nach sowieso Apps, die extra gemacht werden. Ich hab am Handy das WP App schon sicher 4 Jahre oder länger und da war ja noch der alte Editor am Computer bzw. die Möglichkeit der Auswahl. Beiträge lesen und kommentieren tue ich auch oft mit dem Smartphone. Beiträge schreiben aber, bis auf ein paar wenige Ausnahmen, am Computer. stimmt – einerseits – was den heutigen Gebrauch von Tablets und Smartphones angeht. Was aber die Macher von WordPress zu vergessen scheinen, ist, dass gerade beim Bloggen es doch sehr häufig längere Beiträge gibt. Es ist eben ein Unterschied zwischen Bloggen und Twittern. Warum also nicht die Wahlmöglichkeit zwischen den beiden Editoren lassen. Und was diejenigen, die nachfragen bzw. sich beschweren, besonders stört: die Macher bei WP weigern sich beharrlich, die Frage nach dem “warum” zu beantworten. Das ist Kundenunfreundlichkeit auf die Spitze getrieben. Ich kann nur hoffen, dass uns der alte Editor erhalten bleibt, denn der Neue hat, selbst wenn die Macken beseitigt werden sollten, einfach zu viele eingebaute Unzulänglichkeiten. Ich verstehe es auch nicht, wen das stören würde, wenn dieser “Umschaltbutton” vorhanden sein würde. Und dass man keine Antworten auf das “warum” bekommt, ist wirklich mehr als unfreundlich. Wir können nur das Beste hoffen, dass man weiterhin den alten Editor benutzen kann.